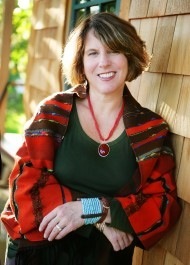 Please welcome Holly to Women’s Fiction Writers! By the time my agent was sending out my fifth novel, I figured I’d paid my dues as a writer. Yes, it’s true that I majored in biology and had never even read James Joyce, but I atoned for that mistake by flinging myself into graduate school to earn an MFA in creative writing. I even published short stories in literary journals where the payment was two copies. I collected enough rejection slips that, one Halloween, I dressed as a Rejection Slip, donning a lacy slip with my rejections stapled all over it. “Are you still writing?” friends and relatives asked, year after year. “Of course. And this one is it,” I always answered. And then came novel #5. This will be the one, I told myself, just like Charlie Bucket in Willy Wonka & the Chocolate Factory: This will be my golden ticket! When the rejections amassed that fifth time, though, I lost faith. That tiny negative voice in my head, the one that was usually like some bee you can wave off, began to sound like a trumpet in my ear. The voice blared: You are not smart enough to be a writer. “Let’s try one more editor,” my blessed agent said. I knew the editor he was sending my fifth novel to, and she is one of the smartest in the business. As a book doctor and ghost writer for many years, typically on nonfiction health books and celebrity memoirs, I’d had the opportunity to work with her on several books. I desperately wanted her to love my novel. I waited three agonizing weeks. Then the editor’s reply came: “I’m sorry, but the novel just doesn’t work for us,” she said, adding various detailed observations about where the plot flagged and why the characters didn’t ring true. “Should I get you some wine?” my husband asked when he found me prone on the sofa, the rejection letter crumpled in one hand and a bouquet of Kleenexes in the other. I was devastated enough by that one rejection to eat my way through an entire box of dark chocolate truffles, drink half a bottle of Grand Marnier, and watch Nicole Kidman attempt to sing in Moulin Rouge. By now, that trumpeting voice in my head had turned cocky and mean: Your sentences are dull and stupid. Your plot lines are insipid. Your descriptions are trite. Your characters are flat and uninteresting. Who would want to read your writing? That was it. I was done with fiction. With so much extra time on my hands, I decided to do something entirely unlike me: I took tennis lessons. My problem was that I was too timid and polite. I got hit on the head with tennis balls more than once, nearly pummeled to the ground by aggressive women on the other side of the net going for their overhead smashes. I spent hours and hours on the tennis court. I joined a travel team and moved up the ranks. Still, I hung back, always playing it safe, until one day my coach lost her temper. The metaphor here is obvious, and so were the flaws in my tennis playing. I had to force myself to net again and again. Until one day, to my shock, I found myself looking for those overheads and smashing them down at my opponent’s feet. I missed a lot of balls, but I made some great shots, too. I became more confident at tennis, and that made me start writing again. What did I have to lose by trying another novel? Nobody was going to publish it, probably, but so what? I love writing fiction. So I started another book. This is one of those happy-ending stories, but with a twist. While I was writing my sixth novel, The Wishing Hill, I also revised and self-published that fifth novel, Sleeping Tigers. Self publishing wasn’t the way I wanted to go, but going to net in tennis had taught me to gamble. I revised Sleeping Tigers and published it myself. Meanwhile, I finished my newest novel, The Wishing Hill. The same editor at Penguin, the one I had always dreamed about working with on a novel, bought it. She recently bought the new novel I’m working on, too. It will be published a year after The Wishing Hill. If you are a writer, you will surely get rejected. Nobody cares but you. Writing, like anything else, is all about keeping the ball in play, watching for new opportunities, and not being afraid to go to net. Want to make it as a writer? You have to fail first—and sometimes many times. Get to the net and write another book. Keep going for that overhead smash, and you might surprise yourself. Holly Robinson is an award-winning journalist whose work appears regularly in national venues such as Better Homes and Gardens, Family Circle, Huffington Post, Ladies’ Home Journal, More, Open Salon, and Parents. She also works as a ghost writer on celebrity memoirs, education texts, and health books. Her first book, The Gerbil Farmer’s Daughter: A Memoir, was named a Target Breakout Book. Her first novel, Sleeping Tigers, was named a 2011 Book of the Year Finalist by ForeWord Reviews and was more recently listed as a Semifinalist 2012 Best Indie Book by Kindle Book Review. She holds a B.A. in biology from Clark University and an M.F.A. in creative writing from the University of Massachusetts, Amherst. She lives north of Boston with her husband and their five children. Love this, Holly. That’s my story, although I never saved the years of wretched rejections and so missed the perfect opportunity to paste them into a costume. I’m so pleased for your present success and can relate to friends and family squinting to ask, “Are you still writing?” Well, yes. Of course. Perhaps the failed who persevere are the ones with two (or more) books sitting on their hard drive, just waiting for recognition. Which is how I also have two coming out in 2013. Of course, I also have years more grey hair than you. Can’t wait to read your book–and it’s true: such a lovely cover. Good for you, Holly! I love the rejection slip Halloween costume–hilarious. What is The Wishing Hill about? Where can I find a synopsis? What if everything you knew about your life was wrong? Years ago, Juliet Clark gave up her life in California to follow the man she loved to Mexico and pursue her dream of being an artist. Now her marriage is over and she’s alone, selling watercolors to tourists on the Puerto Vallarta boardwalk. When her brother asks her to come home and care for their ailing mother, a flamboyant actress with a storied past, Juliet goes reluctantly. She and her self-absorbed mother have always clashed. Plus, nobody back home knows about her divorce—or the fact that she’s pregnant and her ex-husband is not the father. Juliet intends to get her mother back on her feet and return to Mexico fast, but nothing goes as planned. Instead she meets a man who makes her question every choice and reawakens her spirit, even as she is being drawn into an ancient feud between her mother and a reclusive neighbor. Little does she know that these relationships hold the key to shocking secrets about herself and her family that have been hiding in plain sight in her small New England town. Tried that for a while, Holly. My sister and daughter thought it would be good for me to have a do-over. I’m vain enough to wish that I cared more–or took the time. (Hmm, do those words even work together? If I’m vain, that ought to be enough to make me care. So perhaps I’m just lazy?) But I’d rather be sailing or writing, so I’m usually just a pull-it-back-in-a-ponytail kind of woman–much to my NYC fashionista daughter’s horror. Love the premise of your story. We sailed the Sea of Cortez for several years, and I adore Mexico. Can’t wait! Well, the nice thing about NOT coloring your hair is that you can afford more trips to Mexico! True. I did the calculations last year: we three — Mama included — could fly back to Mazatlan or PV, stay in an ocean-front hotel for a week, and have the dental work done–with cash left over–for what the dentist wanted here in the States. Sigh. Shoulda/coulda while we were there! I need to hear more about this! I never thought of going to Mexico to the dentist! Holly, great trajectory. I admire all the power you put into your writing. Over and over again we learn that though we might cover ourselves in rejection slips, we need to keep writing and working and getting better. Exercise that writing muscle. Congrats. Thank you, Zan Marie! Best of luck to you as well. Now I’m going to go START WRITING. Wow. I loved everything about this post (and so fun to hear your story, Holly, since I’ve seen your comments alongside mine on WFW over the years … has it been years, really?). The metaphor was lovely and the message so hopeful and clear. THANK YOU for the inspiration today. I’m heading out to search for/read more about The Wishing HIll. I’m so excited for you (and so interested in your first self-pub decision, then almost simultaneously landing that editor and publisher you always dreamed of). Congratulations! July 2 will be here before we know it! Thanks for the email addy! Congrats on your upcoming release, Holly! I’ve often said that no one believes in your work as much as you, and this story definitely supports that theory. I’m sure you’ll achieve much success in the years to come! Great piece on the persistence that is even more necessary than talent in writing. (because with persistence, any talent you have can be amplified!) I’m inspired as always, even while admitting I’m developing alittle tennis elbow carpal tunnel syndrome! Wonderful story, Holly. Thanks so much for the inspiration. 6 books … WOW. Next to your intrepid spirit, I guess that starting on a new book, after living in the freelance film world for the last 8 years, shouldn’t be all that daunting. 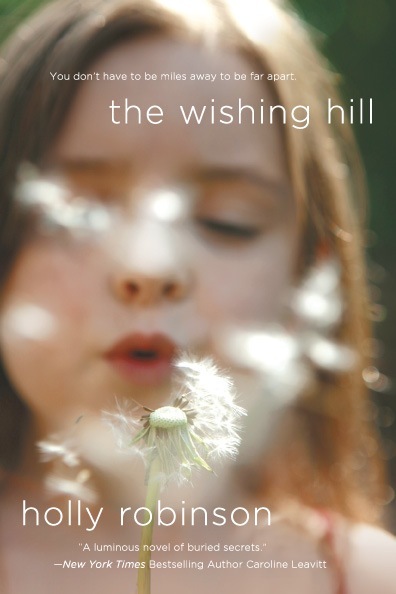 Please send out a reminder when Wishing Hill publishes. And congrats! Such an inspiring post! congrats on achieving your dream–and getting better at tennis. LOL! Amazing tenacity. Plus five children!! This is the part that kills me. I have four and am now on my second book, but most of the time my mind is like my washing machine! A husband who offers a glass of wine, now that’s a marriage! A husband who offers a glass of wine is the reason we HAVE five children! I love your story, Holly, and love your tenacity even more! Thanks for sharing your journey. It is balm for the aching writer’s soul! Well, when you were wallowing in chocolate and wine, I bet you never thought what a good story that would make once your book had been published… Well done for returning to fiction and for setting such a wonderful example. It is the support of readers and writers like you that make ANY writing possible (in addition to the wine and chocolate, of course). Thank you so much, everyone, for reading this post and taking the time to comment. We all know what a time drain it is to engage in social media–but what a lift it gives the recipients when people take time to communicate. I so appreciate you all. Holly, this is such a great story! I am so inspired by you all the time! Little did I know you’d had to resort to playing tennis to keep yourself in the writing game. I thought you were naturally just talented and tenacious. I’m printing this out to give to my workshop students–the ones who think writing consists of one first draft and then driving the check over to the bank. Thank you for writing this–and as someone who’s been lucky enough to read The Wishing Hill already, may I just say that everybody else is in for a great treat!! Well, Maddie, I want everyone here to know that you’re the one who helped make everything happen for me this last time–nobody helped me more with that synopsis than you did. Thank you, my dear, for always being such a great mentor to me, and to writers everywhere, with your great book column. I can’t wait to read your new novel! Great post Holly. I’ve written, re-written, edited, re-written, edited… you get the picture my ONE book for two years now. I don’t have rejections, just silence. How did you feel about self-publishing? I have always said that if I could not get an agent to buy into my book it just wasn’t good enough. Now, I actually hate to admit, I am thinking about self-publishing. Is it a cop out? What a great, inspiring read. The brilliance of the rejection slip Halloween costume almost made me wish most submissions weren’t electronic these days, or I had thought of it myself back when they weren’t!